This blogpost is sponsored by the National Institute for Argentine Yerba Mate. All opinions are my own. When I was at Trader Joe’s a few weeks ago and spotted the first pumpkins of the season, I felt conflicted. Why rush it? I feel like school has barely gotten going. To me, pumpkins signify Halloween, which means Thanksgiving is just around the corner and we all know what comes after that! I can’t deal. So I am drawing the line at decorating my front yard with pumpkins, and instead embracing pumpkin bread, pumpkin swirl bars, pumpkin stew and, of course, the pumpkin spice latte. Sort of. If you’ve been hanging out with me long enough, you know I am Team Tea, not Team Coffee. In fact, I am a little obsessed with all types of tea and I have at least 1 cup a day. Argentine Yerba Mate is a type of tea I have become very fond of over the last few years. 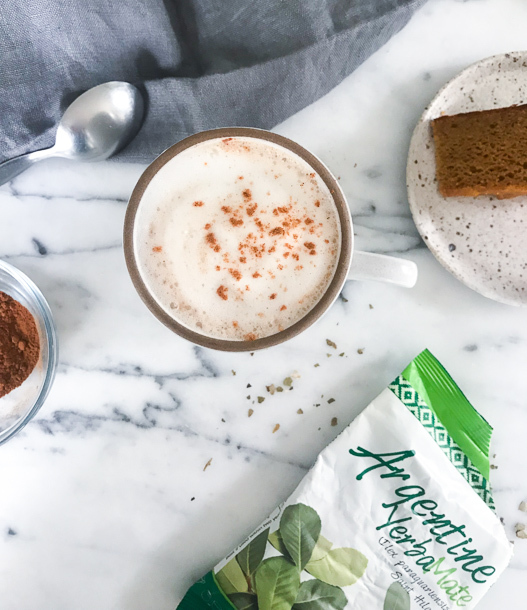 Originated and grown in Argentina from the yerba mate tree, this tea is chock-full of powerful antioxidants (shown to be even higher than green tea) and nutrients such as vitamins B and C, zinc, potassium and manganese. Yerba mate has been found to be ‘hepatoprotective’ which translates to: ‘protecting your liver cells’ and can help in weight loss. I also love that it provides as much energy as a cup of coffee but isn’t as harsh on your stomach. The traditional way to consume it is to prepare it in a traditional Argentinian gourd and drink through a straw, but I always drink it out of a mug. Obviously, if you’ve never tried yerba mate on its own as a hot drink, you should! 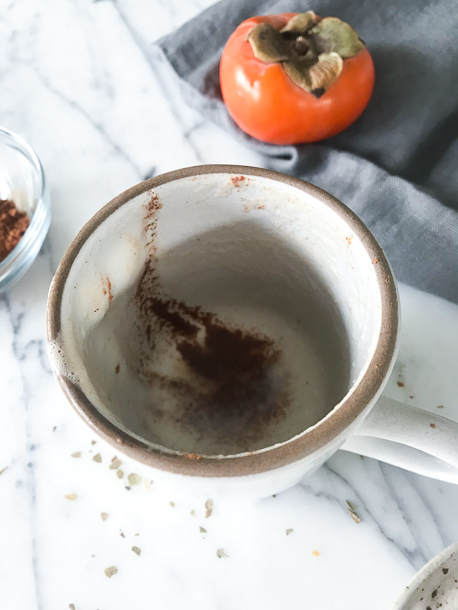 And then make this pumpkin spice yerba mate latte (say that 10 times fast!) I have settled on Argentine Yerba Mate as the best quality and flavor. Some brands to look for are Rosamonte and CBSe. 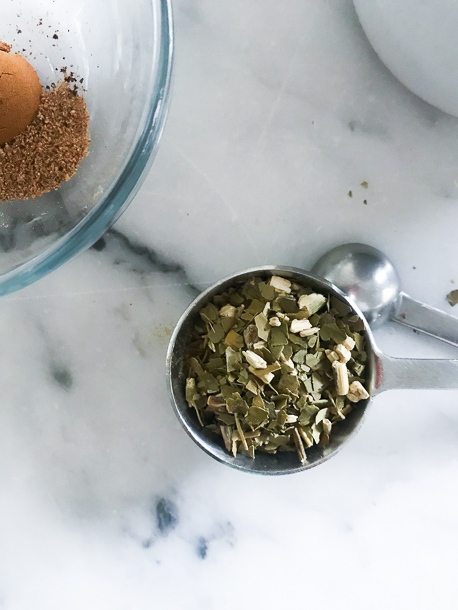 Have you tried yerba mate yet? How do you enjoy it? Steep the tea in the ½ cup water along with the sweetener in a small cup or bowl. Let steep for 5 minutes. 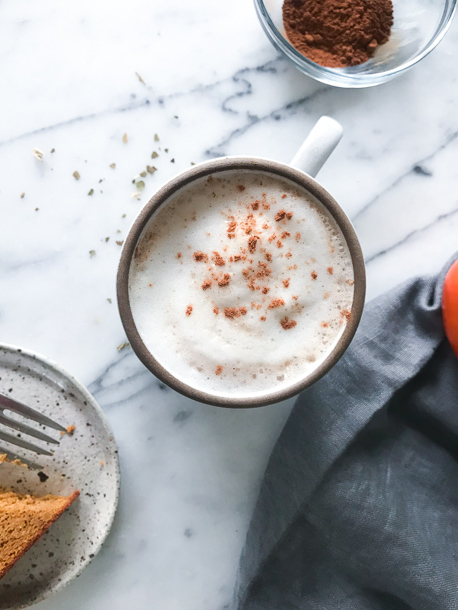 • I used 1 teaspoon of sweetener because it allows the earthy flavor of the latte to shine through. However feel free to add sweetener to taste! • If you like a cap of frothed milk, heat ¾ cup milk and add to the glass blender and put the remaining ¼ cup milk into a frother. Top your latte with the frothed milk. • Spices are flexible. For example, if you like it spicier add more cloves.